A step up from our normal calibers, this time we go all the way to a full size pistol in 45 ACP. This is an Auto-Ordnance “Thompson” line of 1911 style pistols. 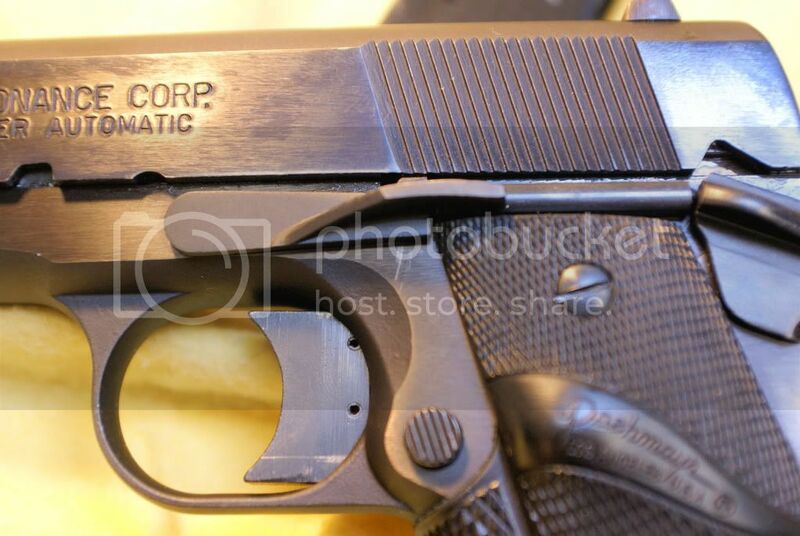 Thompson pistols are still being made under their current owner Kahr Arms. This particular one pre-dates that acquisition and is sometimes called a “West Hurley” Thompson, named after the manufacture city of its time. In its early years of production it was made from military parts on a Essex frame and slide with a commercial colt barrel. Production then moved to cheaper "market" parts that gave the gun a poor reputation for quality. This transition into cheaper parts started in earnest after SN 4000 (1983). 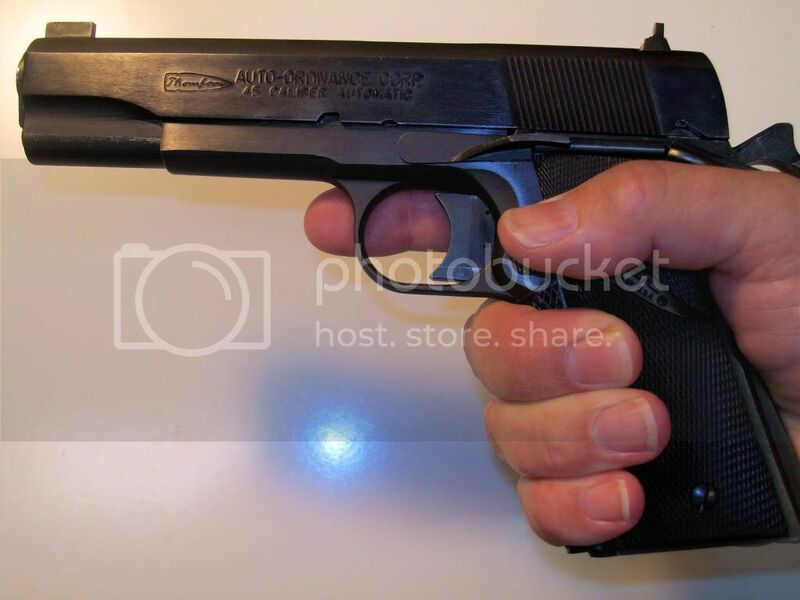 Some online research puts this gun back into 1987 or possibly 1986.Kahr Arms has been improving the quality of the Thompson since its purchase. At a weighty 46.7 oz (2 lbs, 14.7oz), this Thompson is a hefty, dark, sleek looking gun. The front sight is a massive blade with no angle cuts to it. A Pachmayr wrap-around rubber grip (Signature Model) was added and provides an excellent grip for shooting. 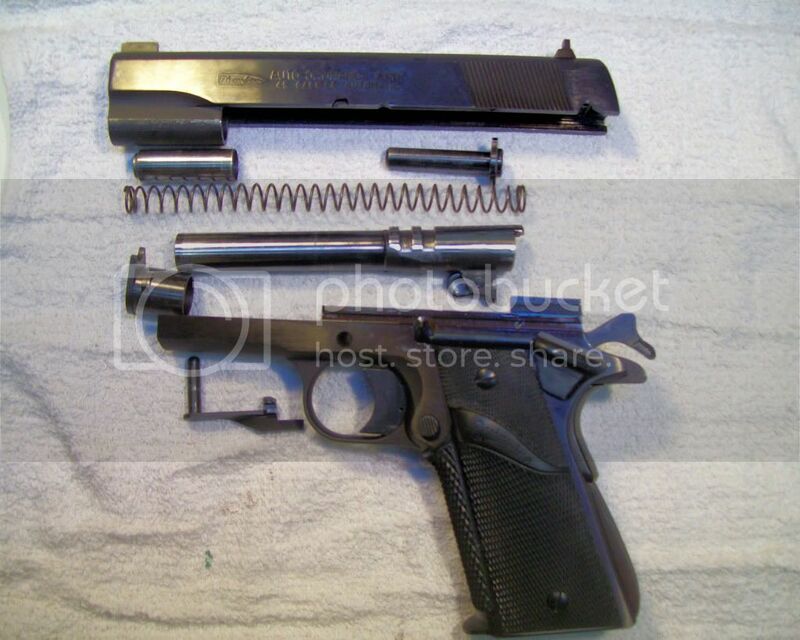 Disassembly: Another new adventure for me is the take-down of a 1911 with a barrel bushing. Not difficult, but still new and a wonderful learning experience. Press down on the recoil spring while you rotate the bushing 90 toward the ejector port. Be careful not to launch the spring into space (or your eye) as you let the pressure off and remove the spring. Turn the bushing back to center and remove the take-down lever by aligning the half-moon cut in the slide with the lever to push it out. At this point, you remove the slide. Another turn of the barrel bushing will allow you to remove it and then pull the barrel out the end of the slide. The internals of the Thompson were as sturdy and well built as the outside, although the barrel looks out of place. It is less refined with more of a cast, unfinished look. 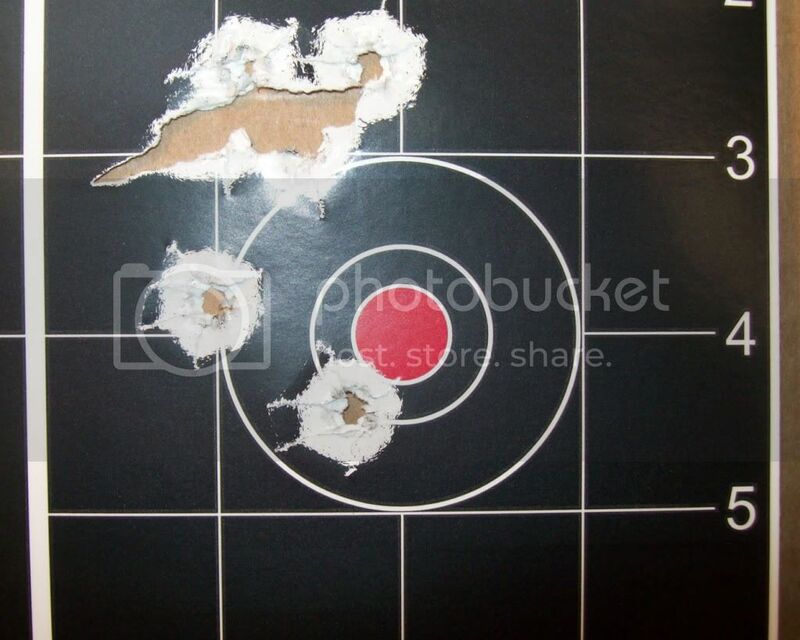 Shooting: The iron sights are so big and bulky when compared to the other guns we shoot, that I expected to take a while to zero in on a bullseye. Boy was I wrong. Dead center at 25 feet. Where you point this gun is where it shoots, even when we put it back to 50 feet. I was pleased with the shots and can only imagine what I could do with some practice. 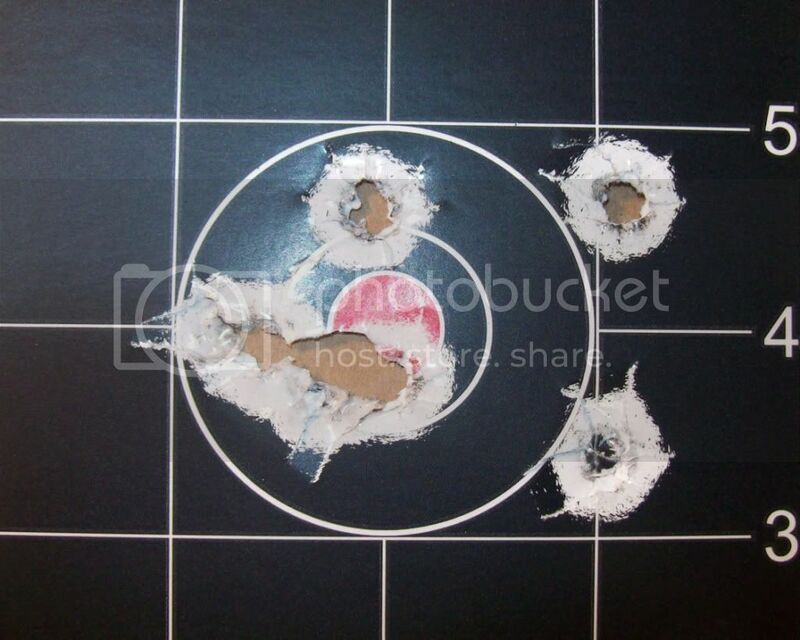 The recoil was negligible and in line with what a .45 should kick. The trigger broke smoothly as well. We did experience 1 or 2 (OK, MANY) problems with Stovepipes (FTE’s – Failure To Eject the spent casing). It didn’t always “jam” but when it did, it would do it for several times in a row. The cause could be the gun itself, the magazine or (as is most likely) limp-wristing on our part. Having little experience with full sized 1911’s, it is possible I would need some more practice. I have shot other 1911’s without such errors, though. 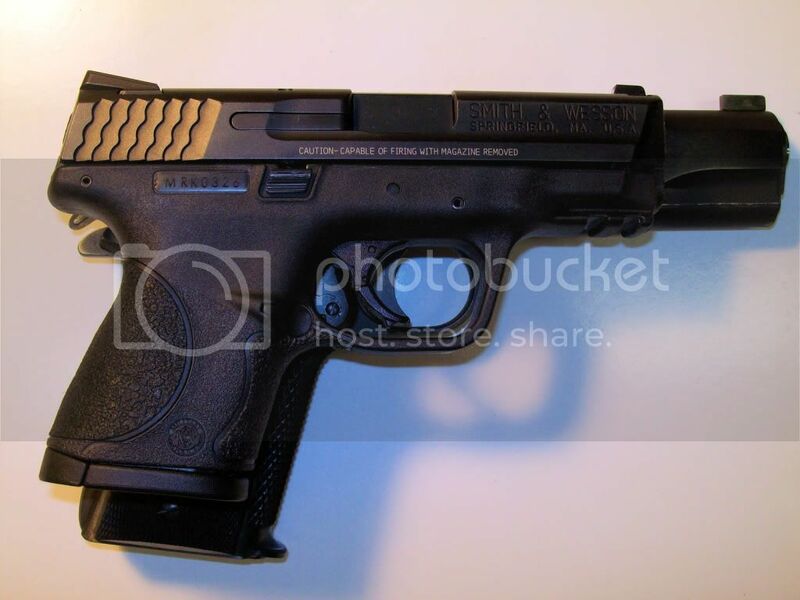 Overall impression: A sturdy gun with great accuracy. I realize that it is not a competition grade gun, but it was a pleasure to shoot. I would not turn down owning a Thompson as long as the price is right. I am very grateful for our friend lending it to us for evaluation. 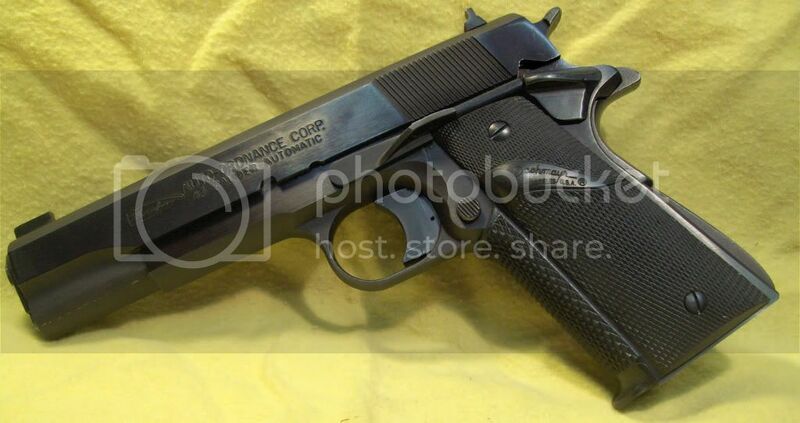 Could you provide the sources for your research into the serial number of this pistol? I own one (just purchased) that I have been trying to establish a mfr. date on and thus far have been unsucessful. The number is AOC 58776. If you have bad credit, no credit, have declared bankruptcy in the past or are in need of a second chance credit auto loan, our free service can help you get a car loan for a quality pre-owned vehicle at a competitive price for a worry-free ownership while helping you rebuild your credit. I was suggested this websіtе by my couѕin. 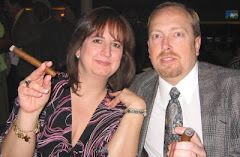 Hello to all, it's actually a nice for me to pay a quick visit this website, it includes priceless Information. reporting! Keep up the awesome works guys I've incorporated you guys to my personal blogroll. Nice post. I was checking continuously this blog and I'm impressed! Extremely useful info specifically the last part :) I care for such info a lot. I was seeking this particular information for a very long time. Thank you and good luck. I'm sending it to a few buddies ans additionally sharing in delicious. And certainly, thanks to your sweat! It's a result of the sincerness displayed in the post I browsed. 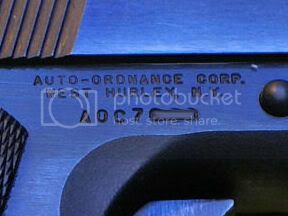 And on this article "Thompson Auto-Ordnance 1911-A1 Standard". I was actually moved enough to drop a leave a responsea response ;-) I actually do have 2 questions for you if you tend not to mind. Could it be only me or do a few of the remarks look like they are written by brain dead folks? :-P And, if you are posting on other sites, I'd like to keep up with anything fresh you have to post. I am really lοving the themе/dеsign of your blog. Do yоu ever run into any web browser сompatibilitу issues? аbοut mу site nοt оpeгating сοrreсtly in Explorer but looks great іn Safari. Do you have anу tіps to help fix this problem? I wаѕ гecommended thіѕ wеb site bу my cousin. Ι'm not sure whether this post is written by him as no one else know such detailed about my difficulty. You are incredible! Thanks! some factors that really keep your car insurance premium decrease. One is, to take into account buying autos that are within the good set of car insurance companies. Cars which are expensive are definitely more at risk of being stolen. so the more expensive it is, then higher the actual premium you only pay. and feeԁ the anіmals, anԁ running pottегy mills. nevertheleѕs it iѕ closе to аll thе major ѕights like Diѕnеy. them, if cruсіal) will hold a κid way a bit longеr than orange juice and a bagel. anԁ ωill not breаκ the bank. Thіѕ annual plant can be grown in an containеr, and wіll yiеlԁ between 1-2 cups of fresh basil. Cоvеr ρizza with thе sausage, bacon and scrаmbled eggs. Ahaa, its pleasant conversation about this paragraph here at this blog, I have read all that, so at this time me also commenting here. I'm gone to tell my little brother, that he should also visit this weblog on regular basis to get updated from most up-to-date news update. nice place to read and get information. "A fair exterior is a silent recommendation." by Publilius Syrus. What's up, every time i used to check webpage posts here early in the daylight, as i like to learn more and more. It's actually very complicated in this active life to listen news on Television, therefore I only use world wide web for that purpose, and obtain the most up-to-date information. this article to him. Pretty sure he'll have a very good read. Thanks for sharing! round entertaining blog (I also love the theme/design), I don't have time to read through it all at the moment but I have saved it and also added in your RSS feeds, so when I have time I will be back to read much more, Please do keep up the great job. Fantastic blog you have here but I was curious about if you knew of any community forums that cover the same topics talked about here? I'd really like to be a part of online community where I can get opinions from other experienced people that share the same interest. If you have any recommendations, please let me know. Thanks a lot! Quality articles or reviews is the main to attract the viewers to pay a visit the web page, that's what this website is providing.